I’m thinking of taking a kickboxing class. Can anyone try this? Posted 30 June 2010 under Ask Us. 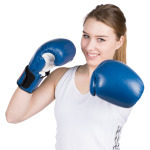 Kickboxing is a great exercise for everyone, no matter what your fitness level is. During class, you’ll learn fun cardio moves that tone the legs, abs, and upper-body. It’s a great way to release stress and learn self-defense moves at the same time.